Our team brings insight from decades of collective Financial Planning expertise, while relying on over a century of strength and resources from Northwestern Mutual. We create an educational environment to instill confidence in the execution of your personalized Financial Plan. Craig Garrison is the son of a 35 year Financial Services industry veteran. After growing up seeing the joy and personal gratification that his father received from the profession, when Craig was ready for a change from Public Accounting, Dad was consulted. Craig also talked with his Northwestern Mutual Financial Representative, Ben Miller, about career options. As a Financial Representative, Craig Garrison saw the perfect opportunity to combine his financial and accounting background with his strong desire to help others accomplish their financial objectives. Craig takes great pride in the way he builds client relationships based on trust, integrity, and honesty. Craig was born on the east coast. After finishing college at the University of Maryland and competing on the varsity wrestling team, he began work as a public accountant with Arthur Andersen. While with Andersen, Craig transferred to Denver. 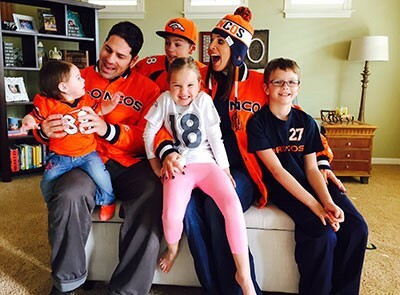 Craig lives with his wife, Jes, and their five children, Connor, Grant, Bergen, Caslin and Steele, in Golden, Colorado. Timothy R. Hall serves as Garrison Financial Group's expert in financial plan design, asset allocation, securities and investment operations. Tim relocated from North Carolina to join our team in West Denver in 2010, and he is committed to delivering exceptional long-term investment strategies to better our client's financial security. With a background in modern holistic financial planning, Tim understands the ever-changing global economy and the insurance, investments and ideas that are needed to meet our client's financial goals. Tim graduated with a BS degree from the Financial Planning department at Virginia Tech. Tim began his career with Northwestern Mutual as a college-level intern in Raleigh, North Carolina. In an effort to continue his in-the-field education, Tim obtained his Life & Health insurance licenses before graduating college, and, in 2010, he received his Series 7 and 66 securities licenses in addition to his Variable Life insurance license. Tim is a CERTIFIED FINANCIAL PLANNER™ professional and, in 2012, he received his Chartered Life Underwriter® and Chartered Financial Consultant® designations from the American College and the Certified in Long Term Care designation from the Corporation for Long Term Care Certification, Inc. In 2013, Tim received his Chartered Advisor of Senior Living® designation from the American College. In his spare time, Tim is an avid golfer and skier. Tim regularly travels to see family and explore all that Colorado has to offer. Feel free to contact Tim with any questions you may have regarding your financial security, financial planning, or wealth management strategies. Katie Cline worked in the non-profit industry for 10 years before joining Garrison Financial Group in September of 2018. She started her career at Kroenke Sports Charities as the Programs Manager after graduating from the University of Colorado Boulder. She then moved on to work for Denver Active 20-30 Children's Foundation, a men's volunteer organization that puts on large-scale fundraising events to raise money for Colorado children in need. She now brings her passion for service, customer experience, and marketing to Garrison Financial Group. Katie was born in San Diego but moved to Colorado at a young age. She enjoys walking her dogs around Wash Park, trying new restaurants, hiking, strong coffee, and weekends in the mountains. She and her husband Keith will welcome their first child (a girl!) in May 2019. You may be hearing from Katie when it comes time to schedule your next meeting at our office or to confirm an upcoming appointment. Matt graduated from the University of Colorado with a BS degree in Finance from the Leeds School of Business. Matt began his career with ALPS Fund Services, and during his tenure, grew to manage a team that was responsible for processing all trades, transactions and money movement for over 35 mutual fund families and their investors. He then made the transition to the alternative investment space and became the Operations Manager for NorthStar, a non-traded REIT fund sponsor. In that role, he was responsible for overseeing all aspects of the funds servicing department including trades, reconciliation and investor inquiries. Looking to blend his expertise in processing, while also becoming more client facing, the jump to Garrison Financial Group was the perfect fit. Matt looks forward to working with all clients of Garrison Financial Group and will be the point person for all paperwork and processing needs. In his free time, Matt enjoys the outdoors. On the weekends, you can usually find him hiking, golfing, or walking with his dog. He loves smoking and grilling meats on his Big Green Egg, and recently started brewing beer. Matt lives with his fiancé Shelby, and dog Merlin in Denver, Colorado. Andy has been a member of Garrison Financial Group since 2014 as our Planning Coordinator. He received his BA from Colorado State University in 1996. After an 8 year career at Safeco Insurance Andy stepped away to become the at home parent of his family, supporting his wife Lisa’s career and raising their two boys. After 8 years away from Colorado with moves to Kansas, New York, and Louisiana, he and his family came back home in 2014. While outside of work, you can find Andy driving his boys between activities, helping coach their sports teams, traveling, cooking, and volunteering.